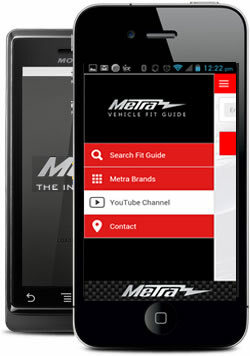 Metra Electronics introduces its first mobile application and brings the best of Metra to iPhone and Android mobile devices. Search our parts catalog with the Vehicle Fit Guide or search by part number to find exactly what you’re looking for. View product manuals and Metra videos as an on-site resource, or check out the many Metra brands that make us the Installer's Choice, and the leading manufacturer of automotive electronic parts.